It’s the day before our family adds two more feet, and we’re incredibly excited with a seriously big side order of nerves. I can’t believe that we get to meet our second little miracle baby so soon! I guess being the second time around we’ve learnt what the real newborn essentials are. Or, at least the essentials that have really worked for us! 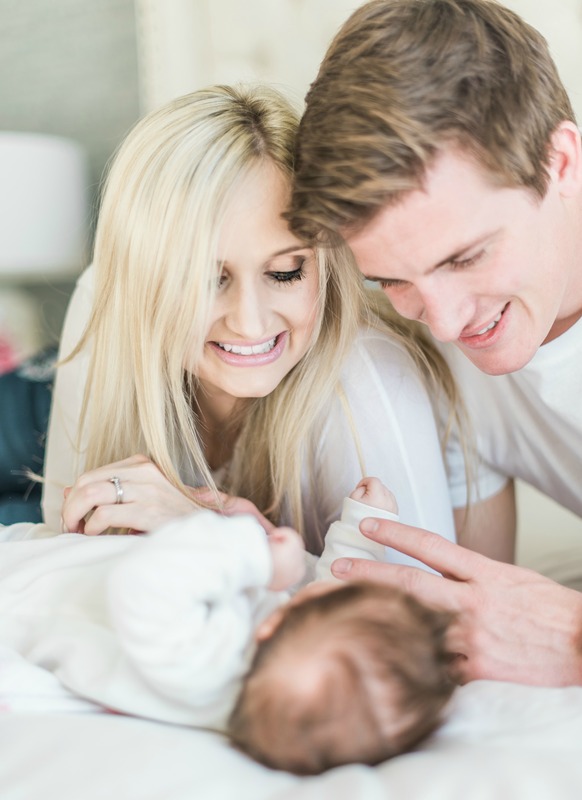 I feel more confident this time that I have everything we need – with a few added awesome new products that I wished we had for KJ, our firstborn, which we promise to share soon when we home. 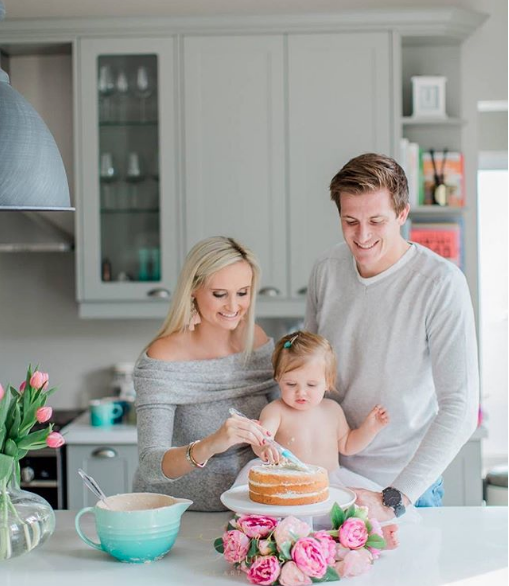 If you’re preggers for the first time; you’re probably you-tube’ing, googling, reading, strolling through aisles, seriously overwhelmed, and questioning everything (like I did) as you wonder what on earth you REALLY need for your baby’s first few days earth-side. It’s part of the fun, I guess, and it’s also part of the confusion. I am no means a mama-expert or pro (wait, is there such a thing? ), and believe me – while my bags are all packed – my emotions are splattered everywhere as I start to countdown the hours. 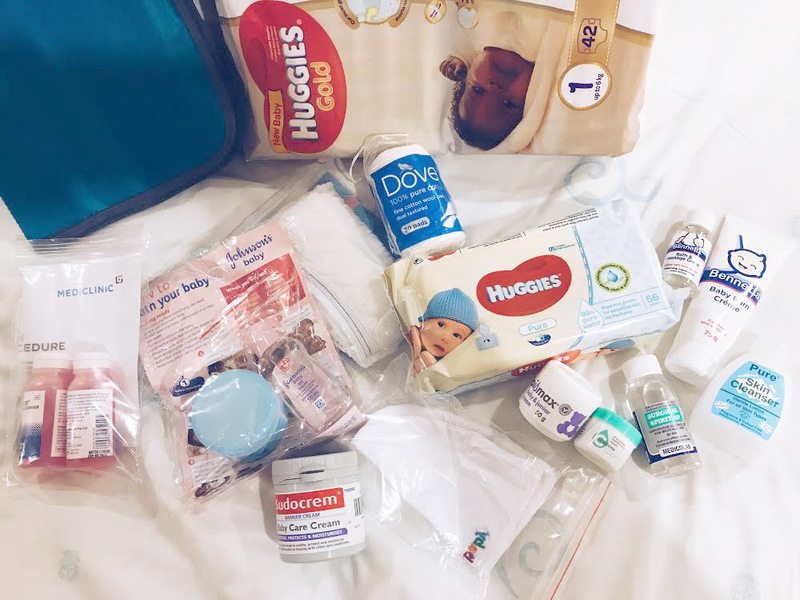 Our very next stop is the hospital, so we thought we would share our list of what to pack in your hospital bag – for real. Oh, and a few tips to prepare for your (probably three-night) hospital stay. It’s also worth pointing out that I always over pack (never will admit that to my husband); so I tried to be exact this time as you don’t want to be that mama that strolls in with your XXL wheely bag like you’re checking in for a two-week island vacay. In your baby pack, the hospital provides 1 x small pack of newborn nappies, 1 x wipes and a tube of bum cream, plus much more (as seen in photo). I did pack my own tub of “Sudo Cream” as that is our preferred bum cream. Mediclinic’s don’t provide earbuds for umbilical cord cleaning, so don’t forget if having bub at a Mediclinic. You don’t need to bring your own bottles, formula, bath wash etc. See a picture of everything we got given in our Mediclinic baby pack bag on arrival. SNACKS! Slip a packet of rusks and/or crunchies in your bag for tea & coffee with visitors (optional, but nice). Book your bed, and get pre-authorisation from your medical aid before 30 weeks pregnant, as at many hospitals you get a free 4D scan which you can only use up to 30 weeks. Post 30 weeks baby is too big! Also, often they allow you to come back if you didn’t see much. Get as much sleep as possible, even though sleep doesn’t bank, unfortunately. Go watch a movie (or three) at the cinema’s, and go on a few romantic date nights. Nesting is a real thing, and your partner might find you going mad when starting to clean out his vanity cupboard and bedside table drawer. It’s like we’re preparing for the new baby to do house inspection upon arriving home! It’s normal, and your husband will love his cleaned out vanity cupboard. Antenatal classes are often free at your hospital of choice. Make sure you book these quite well in advance, as we found the classes get full quickly. You can either attend classes in the evening over a few weeks or do a full day on a Saturday. We did one full day and can highly recommend you take with a pillow for your back, a small lunchbox of snacks and a big bottle of water (which we didn’t take, and regretted). Go on the maternity ward tour, which normally is part of your classes. Here you can ask many questions – such as; “Can Dad stay with you and baby in the hospital?” Many hospitals allow this in a private room. Book your hair, nails and waxes around the 36 – 37-week mark. Too many mamas I know missed these appointments (yup, this includes me as KJ came at 37 weeks). If you do a c-section you can’t drive up to four-six weeks after, so great to do this right before. I also went for a wash & blow-dry the day before, to treat my preggers self. Also, find out how your Gynae feels about “gelish.” I was told to put light gelish colours on my toes and hands, and that I didn’t have to remove it completely. Don’t feel scared to go straight to your hospital’s labour ward if you worried about anything. In both my pregnancies I have suffered from sharp pains. They checked I wasn’t having contractions, and if the baby is a-okay. You don’t have to call ahead, they are there 24/7 to make sure you and baby are okay and your mind is at ease. Call your emergency gynae practice number before heading to your hospital ER. I sadly learnt twice that ER is the longer more expensive route, and you’ll end up calling and seeing your gynae anyway. If you are having a c-section really early in the AM, then you are normally able to stay over the night before at most hospitals. They allow you to come in at around 8/9pm – which means you won’t pay for the night before. This is especially important to us, as our c-section is booked for 8 AM on a Monday and traffic is a nightmare around that time. We also hope to get a private room if we get there early, as well as unpack and get ready. If you don’t wish to stay the night, make sure you ask your Gynae what time to arrive and what they want you to do beforehand. Obviously natural is different! This time I got given an anti-bacterial body wash to shower with just before, and was told to stop eating at 10 pm. Things to think about and decide for during the birth: 1. Is your partner going to cut the cord? 2. Are you able to do skin to skin (normally not always possible in theatre)? 3. Do you want a birth photographer or are you going to take your own photos? 4. Can you take in a USB with music? Do you want a private, general or luxury room? If you wanting to book a luxury, you should contact the hospital long before, as they normally only have a few of these. If you wanting a private, call the maternity ward ahead and find out how to best make sure you get a private. With my medical aid plan, I sadly do have to pay a little extra. Most of all, relax and enjoy this incredibly new exciting chapter. You’ve got this mama! Oh, and I hope this list helps – as I wish I had one before having KJ. Thanks to Clever Little Monkey for encouraging us to create one to share with their incredible mama community. PS: If you’ve left anything behind, don’t stress, there’s a chemist shop in all hospitals. For anyone who doesn't know me, I'm Ash Knox, all the way from South Africa. I live with my hubby, Bruce, and our little girl, Kayla Jane (KJ). I said hey to mama life in May '17, and we are expecting our second miracle in July '18. While some days I feel seriously hungover (from lack of sleep/probably lack of champagne too); becoming a mama was the best thing to ever happen to my life. After Bruce and I got told we had an 8% chance of ever falling pregnant, mama life is nothing short of a sweet miracle.